Kevin Hart Oscars & LGBTQ Backlash. You are here: Home / News / Kevin Hart Oscars & LGBTQ Backlash. According to his IG post he was given an ultimatum by the Academy. He could make a formal public apology for his homophobic tweets and stay on as the host or he would be replaced. Kevin chose to walk away. In his response he highlighted the fact that he had indeed apologized for his past statements and those apologies would be just as easy to find as his controversial tweets were. Social media is the judge, jury, and executioner for those living in the public’s eye. Twitter and Facebook are great tools for gauging what people are thinking at any given moment, but the often-caustic environment found on social media makes civil discussions almost impossible. Kevin Hart apologized for his past tweets, but those apologies didn’t trend like this controversy has; in the world of social media that’s the equivalent of them not existing. This isn’t an attempt to delegitimize the criticisms he’s faced for his tweets. Kevin Hart isn’t above reproach, but its’s disingenuous not to acknowledge the roll group think plays in social media controversies. Once a topic trends, it becomes popular to have an opinion about said topic. There are people tweeting about this who have never made one public statement of solidarity with the LGBTQIA+ community. 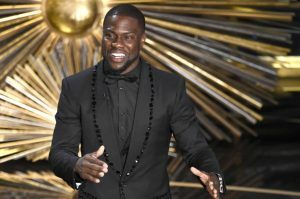 Some of have never watched the Academy Awards, and others have never seen Kevin Hart perform. This doesn’t mean their opinions are null and void, but all opinions aren’t equal. There are people participating in this conversation for narcissistic reasons. The Virtue Signaling: A lot of people weigh in on hot button issues in an attempt to absolve themselves of their own past problematic behavior. I have news for them: it doesn’t work that way. If you’ve laughed, or even snickered a little, at Bernie Mac’s “milk and cookies” routine you are the fertilizer that helped grow Kevin Hart’s troubling tweets. The Doxing: There are people who sit around and scour other people’s social media accounts looking for anything that could hurt them. These aren’t private investigators, they aren’t vetting people for important jobs. These people have too much free time on their hands. They would rather use their time tearing someone else apart than building themselves up. The Accountability: Social media has found a way to hold everyone accountable for what they say or do but the President of the United States. Donald Trump made hundreds of statements just as offensive as Kevin Hart’s tweets. We live in a society that holds comedians to higher ethical standards than politicians. Kevin Hart is out as the host of the Oscar’s. This won’t make one person affected by homophobia any safer. This doesn’t make the Academy Awards an institution with integrity. We haven’t solved any of the underlying issues that led to him thinking the way he did about the gay and lesbian community. We put a band aid on a bullet wound. Sadly, there are people on social media hailing this as some great victory for LGBTQIA+ rights. One may also follow this talented brother on Facebook; ThoughtW and also Twitter; Thoughtwrestler.